Cold and hungry we awoke early several hours before dawn. It had been a rough nights sleep but we where ready and raring to go on our walk. We weren’t going to do the whole Alpine Crossing as we didn’t have enough time, but we at least wanted to experience something of this famous walk. 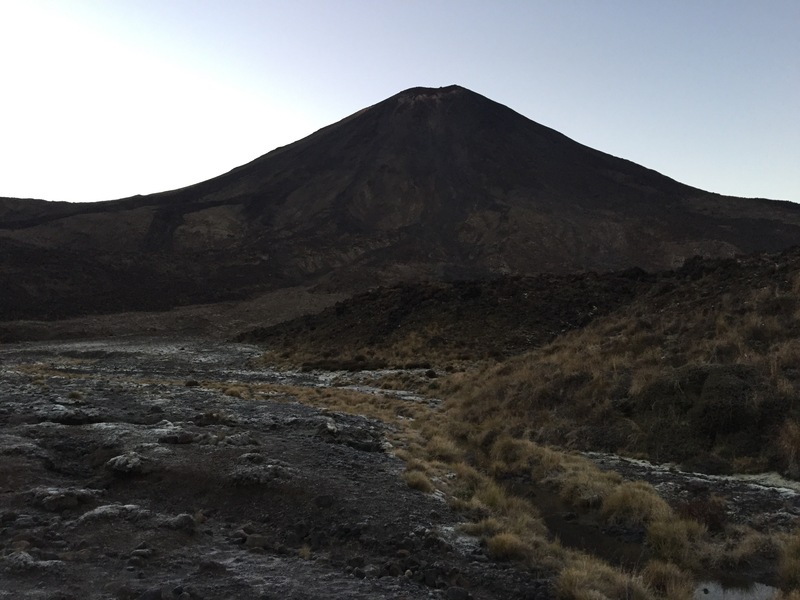 The terrain and landscape was used for scenes and shots for Lord of the Rings, in particular Rohan and Mount Doom. We ate some breakfast: got dressed in the cramped van into some warm clothing and our hiking boots; and set off. It was still pitch black and our plan was to walk the first part in the dark and get to a decent spot for sunrise. Following our torch light we rambled along the rough path. It was seriously cold and the stars still shone brightly overhead. The Milky Way was clearer than we had ever seen. A group of four where ahead of us and we soon overtook them. We were now the first ones out on the track. The stars began to fade as light crept over the hills. Torches off we started to see the stunning landscape and scenery. The flat track began to climb and we walked over streams and boulders. A board walk frozen in frost took us over a marshy stream laden landscape as the track wound up to the mountains. Sunrise began turning the sky behind us red and ‘Mount Doom’ caught the first glimpses of the crimson light. 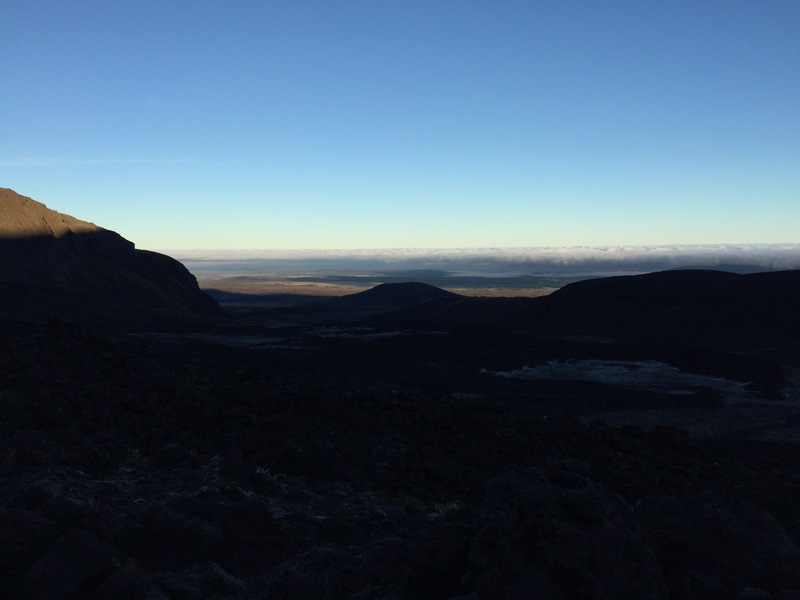 We hadn’t reached a vantage point for sunrise but the light pouring over the mountains in the distance was enough. We reached a small waterfall and rambled off the track to have a look. It tumbled down on to rocks and flowed across the uneven ground forming a river. Next we rounded the corner and began climbing the mountain. We walked up to South Crater and stopped. We had been walking for around an hour and half. From here we could look out across the landscape in wonder as the sunlight gradually worked its way across. 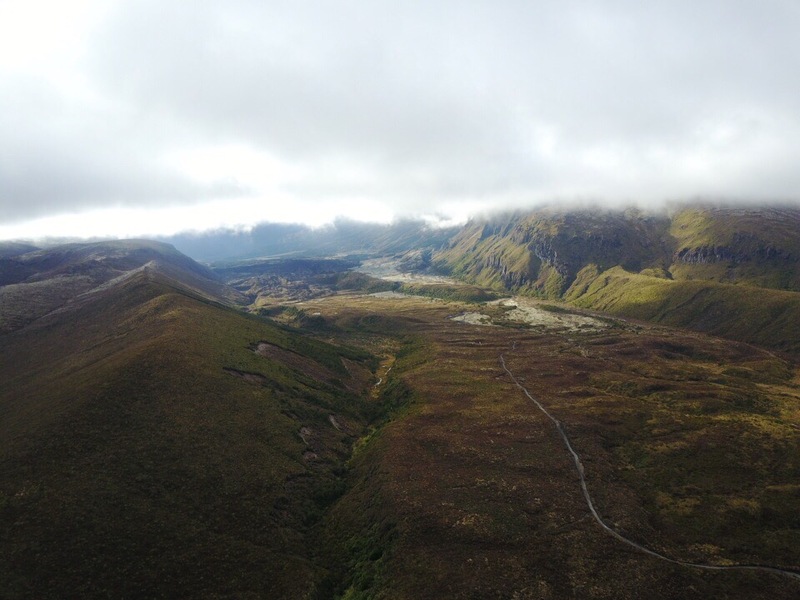 At this point Mike flew the drone up and over the crater and towards the mountain. The light again obliged and we took some beautiful photos. We could of kept walking but our camper van was back in the car park and we had a long drive to Wellington ahead of us. So we turned around and came back the way we had came. The sun now having risen we got some different perspectives on the walk back. The track was also now getting busy with early morning walkers: we must of said ‘morning’ about 50 times. They also came in groups, we figured they were being dropped of by buses. It took us about an hour half back and Mike flew the drone one last time. Back near the car park other mountains in the distance capped with snow also became apparatus. Amazing we had slept underneath them without a clue they were there. Back at the van we had some cereal and hit the road. The drive to Wellington was four and half hours according to the Sat Nav but we knew it would take longer with the winding one lane roads. At various points we stopped along the way to take photos of the amazing New Zealand landscape. From rolling greens hills to wide plains and mountains. The single track roads twisted and turned as we went over countless rivers on one track bridges. We stopped a few times to make food with our limited facilities and eventually got to Wellington despite our Sat Nav’s best efforts to get us lost. In Wellington we stopped in town but not for long and headed to the ferry terminal where we caught a ferry to Picton on the South Island. We drove into the belly of the enormous ship and up onto the deck. The Ferry took 3 hours and we sat down and had some food and charged our electronics. Arriving in Picton around 1am we attempted to find a camp site. The first a 15 minute drive was full, and the second another 30 minute drive was too but we parked and went to sleep anyway. Both exhausted from a long day of walking, driving and sight seeing we got some well earned rest.